Keeping in touch with loved ones is always necessary but sometimes we often forget to send that important message in time just because we were busy with one thing or the other. So many times I have missed to send birthday messages or anniversary messages to my loved ones and friends just because I forgot and it often don’t end well. So if you find yourself in such situations and don’t want to miss that important event anymore, then this article is for you. In this article I will introduce you to some awesome apps to schedule SMS on Android smartphone. That way you won’t have to forget wishing your friends and family a happy birthday or miss sending any important messages anymore. You will now be able to schedule messages to be delivered and set dates and time on your phone. Fortunately, the Google Play store has a couple of Free Android Apps that will schedule your text messages. Text Messages scheduling Apps are sort of automatic reminders that help you to keep your word and hopefully keep folks around you happy. GO SMS Pro is an awesome Android app, not only will it replace the Stock Android SMS app on your device, it also has this nifty feature that allows you to schedule SMS on Android smartphones. Download GO SMS Pro from Play Store. 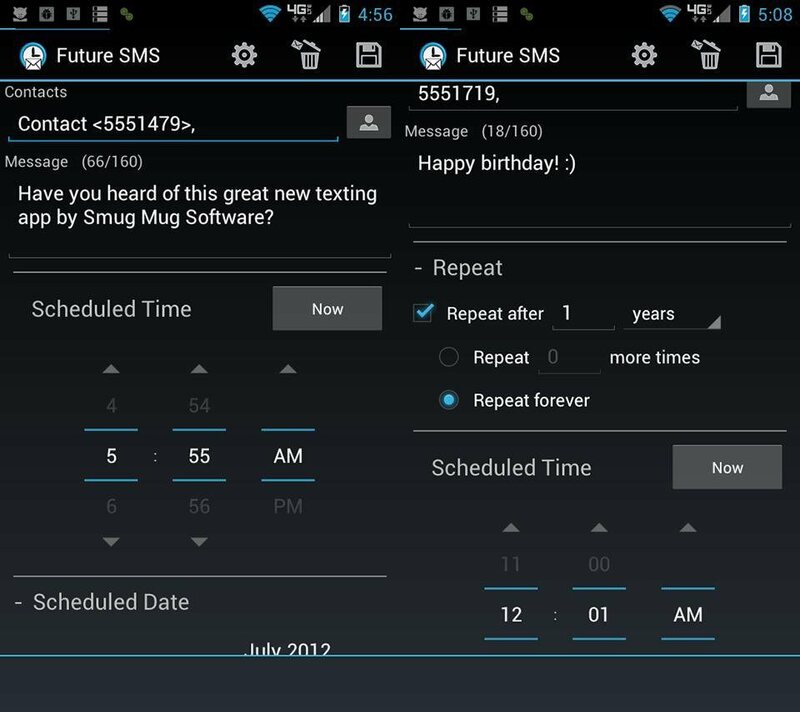 Future SMS Text Scheduler is yet another awesome app to schedule SMS on Android smartphones. Future SMS is a personalized text message scheduling service that gives new meaning to the idea of putting off until tomorrow what you can do today. With Future SMS, you don’t need to duck out of work, class, or personal time with loved ones to fire off that important text message. Future SMS features a highly customizable message scheduling screen, allowing you to draft messages on your own terms. By using the repetition feature, you can make sure you’re always be the first person to acknowledge a birthday, anniversary, or recurring special event! Download Future SMS Text Scheduler from Play Store. 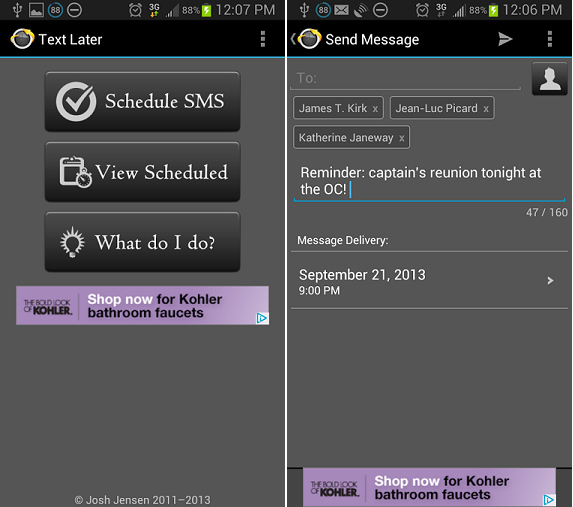 SMS scheduler is the ultimate App to Schedule text messaging on Android. Unlike Go SMS Pro, which comes with tons of other features that you may not necessarily need, SMS Scheduler is light-weight with an easy & intuitive user interface. Download SMS Scheduler (Text Later) from Play Store. Text Later is the simple solution to sending SMS messages at a later date. Need to send a reminder about a meeting? Or maybe you are a little forgetful about sending out Happy Birthday messages to friends and family. Text Later allows you to send out SMS messages to contacts, at any date or time of your choosing. Make sure you have a texting plan through your carrier, as Text Later sends standard SMS messages and you are responsible for any charges from your carrier regarding the sending of SMS messages. Download Text Later from Google Play Store. With these five apps, you can now be able to schedule important messages on your Android smartphone. You don’t have to miss any important event, anniversary or birthday wishes anymore. Schedule your messages ahead of time and get it delivered on specified time and date. Do you know of other apps to schedule SMS on Android smartphone? Use the comment form below to share with me. What was your experience with any of the apps i listed in this article? Which have you used and which will you recommend? Future S.M.S Text Scheduler is my favourite app. I always use this app to auto send SMS to my friends and relatives on their birthday and other occasions. Smug Mug is the best android application developer. Thanks for sharing information. Google Wallet App Review – Netmediablog.